Post subject: Re: DC Collectibles Launches New Line of 'Injustice' 3 3/4"
Yeah, they do look amazing, but the designs of the characters from that game just don't really do anything for me. I really want this to succeed so that we see more and more and more of these sets come out to supplement every corner of the DCU, but most likely, I will end up passing on these. I knew that DC was planning on some Justice League related 3.75" figures, but the "INJUSTICE" theme was something that I did think about. With my comic book discount, the sets should cost me around $25 each instead of $30 each. I liked the Infinite Heroes Deathstroke figure but this one blows that one out of the water. I like it a lot. Green Arrow aside from the arms doesn't look half bad. This is a definite purchase. So where will this be sold? At the DC Collectibles store or at cons only? The first round of two-pack sets will be released in April 2013 and will feature Green Arrow paired with Deathstroke, and Wonder Woman paired with Solomon Grundy. Each set costs $29.95. Next year. 2packs at $29.95. At you local comic shop. Which means the solicits should be in either the Jan or Feb issue of Previews to place pre-orders. to a 30.00 Mass Market item-- that seems like Backward pricing to me.. Honestly I'm not a fan. They could have done a straight DCU line and I would have been much happier. These look off. Yes, I get it they're taken from the game. They still do not appeal to me in action figure form. Thanks. I hope Wonder Woman and Grundy look cool. If that doesn't promote the TV show Arrow, I don't know what does? Hmmm. Kinda on the fence on these ones. I like that they are extending the line. I don't know if I care about these particular versions. I'd much prefer a good articulated version of the classic characters. Marvel Universe has had good success with their line, would love the same here. Well my wallet won't like it... but the rest of me would be happy. Last edited by callmedude on Fri Dec 07, 2012 12:24 am, edited 1 time in total. They're gorgeous but that's too much money. If they were comic-based or even New 52, I'd consider it. The arm of my little Kyle Rayner just snapped off and I had another DCD break this week so I can't sink too much money into these figures even though I love the sculpts. This looks like Deathstroke's new post Rob Liefeld costume. 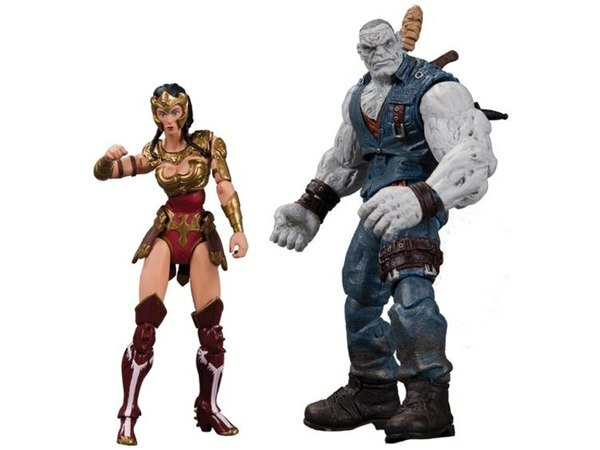 They've added Wonder Woman and Grundy: Pics over at toynewsi. and I'll definitely pass on these versions.